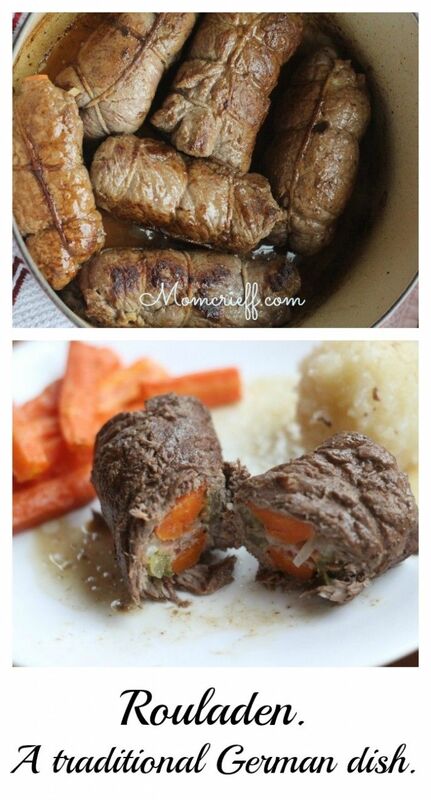 Rouladen – A German vegetable stuffed beef roll. A rouladen is a traditional German main dish. 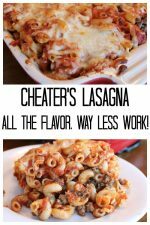 Perfect for Sunday dinner! 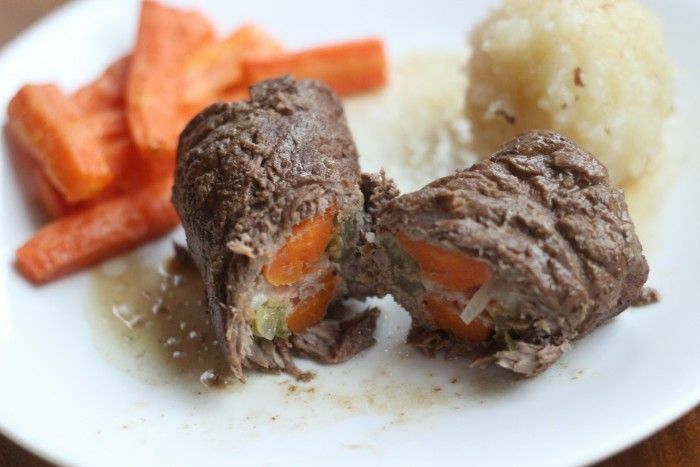 It is best described as a vegetable stuffed beef roll that is braised so that it’s extra tender and juicy! 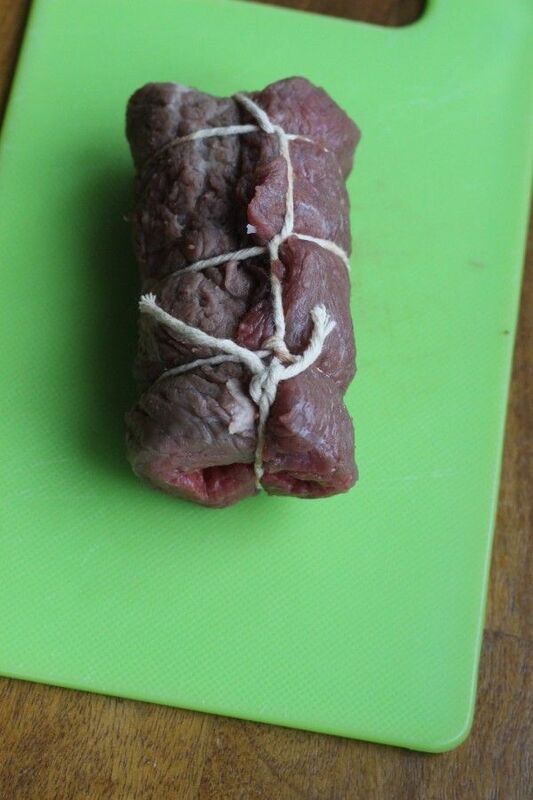 A couple of weeks ago, one of my golf girlfriends mentioned she made rouladen. I remember this dish from my childhood Mom made. I now know she really didn’t get the recipe right. I still remember it, from when I was 10. The dish Ingrid was describing sounded much better. It sounded so good, I asked for the recipe and I’ve made it. And, I will share it with you now. With pictures! If you would like a fancier beef based dish, this is it! Celery sticks, cut to fit roulade. 1 stick per. Sweet Butter Chip Pickles – 2 per roulade. I bought round steak. It was actually a huge piece (Costco). If you get your round steak from the grocery store, you need to eyeball it to see how much is enough. 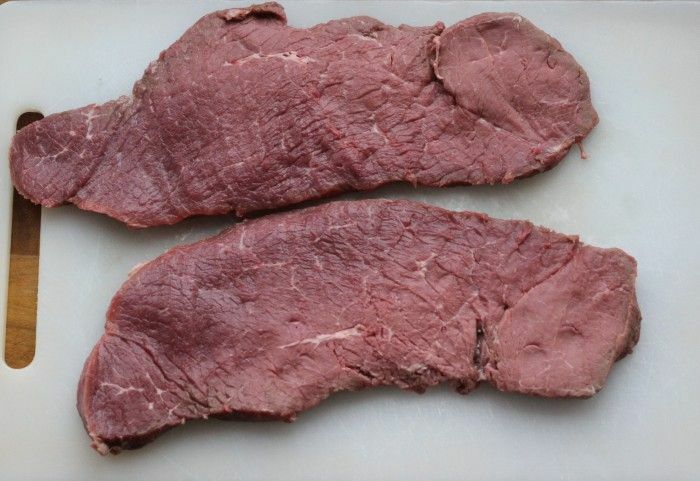 What you want is about 6 pieces of round steak that are 1/2 inch thick and about 4 x 6 inches. The meat I bought was quite thick. As you can see, I cut it in half. I just put the meat on a plastic cutting board, cover with plastic wrap and use a kitchen mallet (not sure what the correct term is). Or, you could use a rolling pin. Anything heavy to pound the meat so that it is about 1/2 inch (or a little less) thick. Cut the meat to pieces of about 4 x 6 inches. 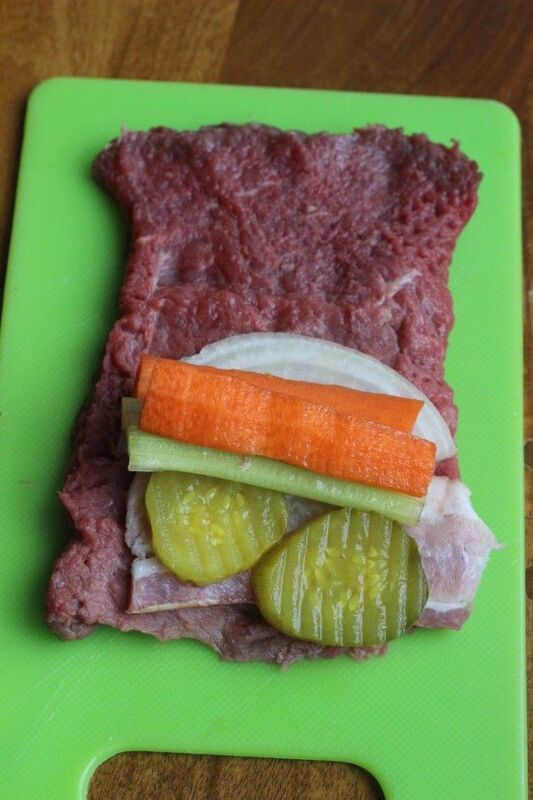 Place a piece of bacon, carrot, celery, some onion, and two butter sweet pickle chips on the meat. Take the end and roll tightly. Securely tie with baker’s twine. I tied the roll together and also went around the open ends, tucking any loose ends under the twine. 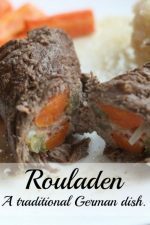 Each Roulade needs to be browned. I used the dutch oven that I was going to cook them in the oven with. 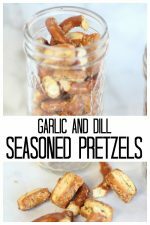 I did 3 per batch because you don’t want to crowd them. Count on at least 10 minutes to brown all sides for each batch. When all have been browned, remove and use a little wine to deglaze and scrap up the yummy bits. Put all rouladen into duty oven or casserole dish where they are fairly snug. 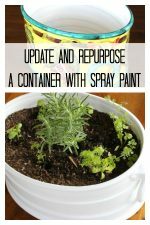 Add enough water to cover. I actually had some beef broth in the fridge so I did half beef broth, half water. Cover with lid and cook in oven for about 2 hours. When you check it, make sure that the meat is super tender. Like fall-apart tender. Oh gosh, this tastes soooo good! And there is tons of gravy. If you prefer a thicker gravy, you will need to thicken it and perhaps add a little more spice (mainly salt and pepper). 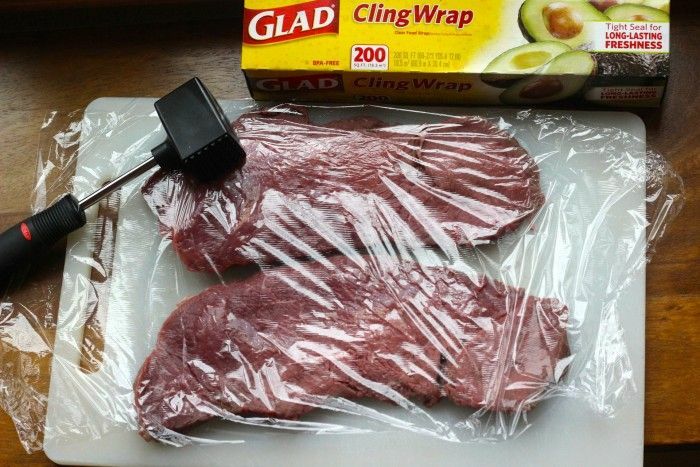 Purchase and prepare round steak. 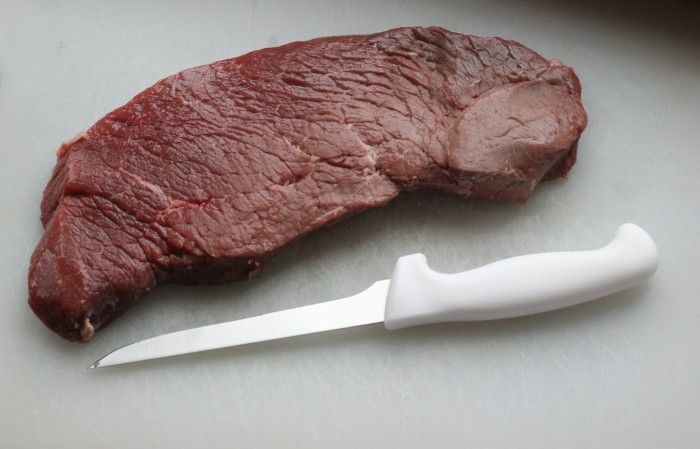 What you want is about 6 pieces of round steak that are 1/2 inch thick and about 4 x 6 inches (after you have cut meat). I cut through the meat to make it much thinner. It still didn’t seem that thin so I pounded it a bit more to thin it. Place a piece of bacon, carrot, celery, some onion, and two butter sweet pickle chips on the meat. Take end and start rolling tightly. Securely tie with baker’s twine. I tied the roll together in two or three spots and also went around the open ends, tucking any loose ends under the twine. 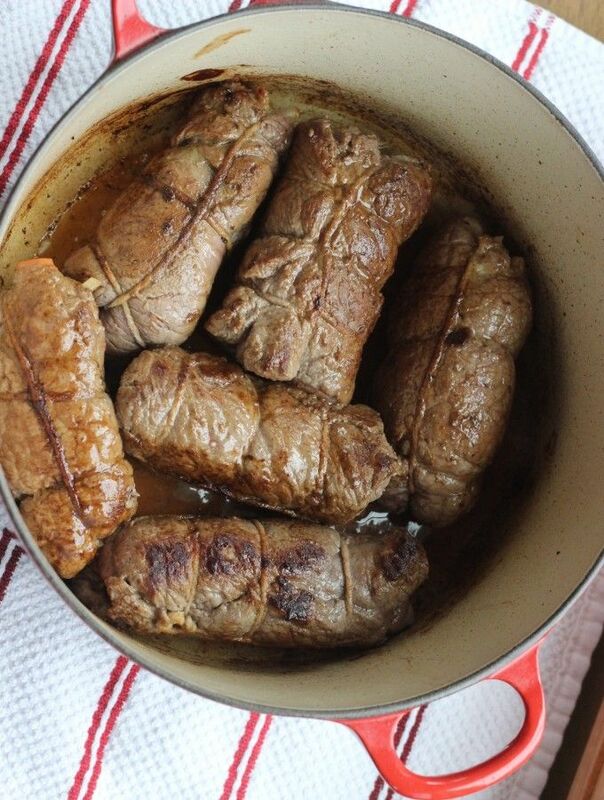 Each Rouladen needs to be browned. 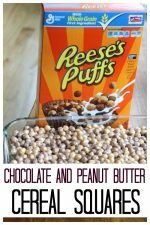 I did 3 per batch because you don’t want to crowd them. Count on about 10 minutes to brown all sides for each batch. 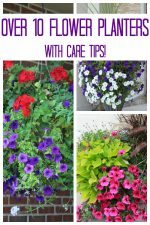 Add enough water to cover. I actually had some beef broth in the fridge so I did half beef broth, half water. Cover with lid and cook in oven for about 2 hours. Check the meat and it should be really tender when done. The meat is really tender. The bacon AND the pickles really add to the flavor. This is a longer prep type meal. I would consider a special occasion type meal. It is really good but it does take time. I made it on a cold, rainy Sunday. It was perfect for that!! Hope you enjoy! The is something a little different. From my German heritage. Shared with me by my friend Ingrid. What temperature in the oven?? Yum, I love stuffed and rolled up meat. Looks extra fancy. My mom was part German but she never made this one.